Who would have thought the testimonials on a web commerce site would be 100% genuine and true? In the case of Cable Chick I can testify that I agree with all the testimonials, great prices, great service and minties! I ordered one day, the cables arrived the next, the prices are great and who doesn't love free shipping and the discount card in my order was a nice bonus. With this Bi-Directional Composite Video to S-Video adapter, it's like turning lead into gold! The alchemical properties hidden within this tiny signal converter must be seen to be believed. 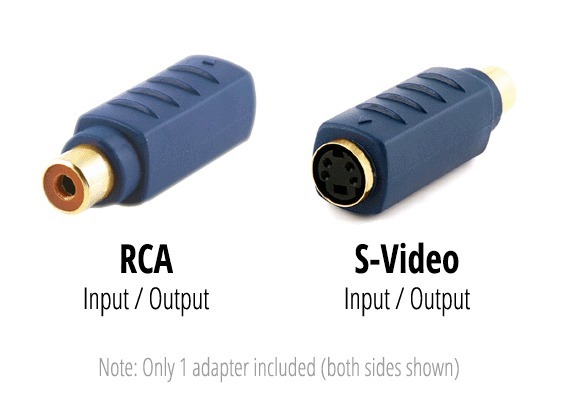 Like King Midas, the golden touch of this Composite Video (Female) to S-Video (Female) Adapter isn't just in its 24 karat gold-plated connectors, but also in its ability to easily convert your device outputs between S-Video and Composite Video – in either direction! It's as simple as plugging it in and letting 'er rip with a basic and handy one-to-the-other conversion. You can even use it at the end of extension leads so you can convert over long distances between two devices! Basically; any time you need your Composite Video turned to S-Video or vice-versa, this unit will have all the magic you need to turn your home theatre setup golden! Don't forget to check out our similar Composite Video (Female) to S-Video (Female) adapter, should you need a Female RCA connection. Answer: "The S-Video side of this adaptor has 4 Pins." Answer: "If the 7 pin S-Video port (also known as a breakout port) works with a standard 4 pin S-Video Cable (some do, some don't) then you won't have a problem." Always happy with the Cable Chick � have never had any problems and things happen like clockwork! I have put many of my friends in contact with your site and they now purchase from you.